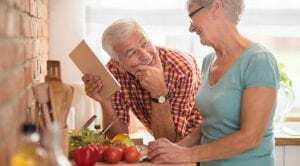 According to the National Resource Center on Nutrition, Physical Activity and Aging, one in four older Americans has poor nutrition. Malnutrition weakens muscles and bones, leaves you susceptible to disease and can put you at risk for becoming overweight or underweight. You may have less energy and more muscle or joint problems as you age, causing you to engage in less physical activity and burn fewer calories. People also lose muscle mass as they age, which slows down their metabolism and lowers caloric needs. It’s not uncommon to experience a loss of appetite as you age. Your sense of taste and smell can also diminish, which can cause you to eat less. With age you become more susceptible to chronic health problems such as diabetes, high blood pressure and high cholesterol. Your doctor may recommend a change in diet to help prevent or treat these conditions. You may need to take medications to manage chronic health conditions. They may affect your appetite or interact with certain foods. Seniors can have age-related oral health concerns that may interfere with eating. For example, dentures that fit improperly can lead to poor eating habits and malnutrition. Lousing a spouse, family member or friend can impact daily habits including eating. You may feel depressed and not want to eat. Your spouse may have been the primary cook and you might not know how to prepare meals for yourself. It’s important that seniors eat a well-balanced diet rich in fiber, vitamins and minerals. When meeting with your physician, talk about your dietary, exercise and daily living habits. Your doctor can recommend any changes or resources if necessary.